But daffodils are far more reliable than tulips for returning each year here in the Midwest, so from now on, if, when, I plant more daffodils, I'm going to keep track of the varieties. In the meantime, if you know the real names of any of the daffodils I've pictured below, please let me know! 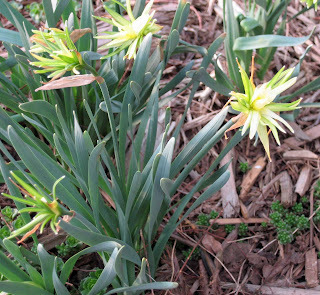 These first daffodils are more suited to a rock garden setting. They have very narrow petals, and don't even look all that much like daffodils, except I know they are because of the foliage. For some reason they remind me of a stressed out, harried person with their hair all wild, so I'll call them "Harried". 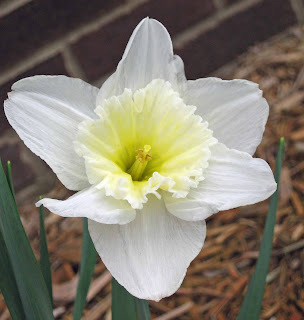 Here's a pretty yellow and white daffodil. It sort of reminds me of a fried egg. How's that for a variety name? "Fried Eggs"
And of course I have yellow daffodils. That's what generally comes in those big bags that scream out "50 daffodils for $5.99" or something like that, and they won't be silenced until you put them in your shopping cart. 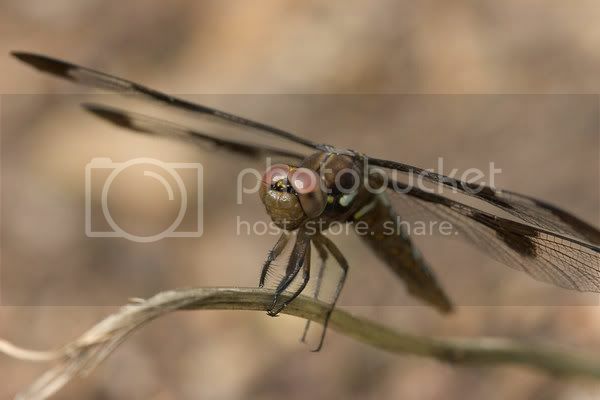 Then you get home and walk around the garden trying to remember where you have already planted daffodils, looking for a spot or two for a few more. So I'll call these "Yellow Screamers". Now this little beauty (a bit blurry, sorry about that), is what caught my eye Saturday and prompted me to go around and look more closely at all the daffodils. I'm sure it has a good and proper variety name, lost to me unless I want to pour over bulb catalogs looking for it. I'll just call it "Pink Lips", even though it is more of a coral color. It reminds me of a pale, old lady with too much lipstick in the wrong shade of pink. And this one is almost pure white, with just a hint of yellow. I think it was white and the garden faires painted it up a bit, so I'll call it "Fairy Yellow". They probably would have finished painting it all yellow, but garden fairies are easily distracted, party a lot, and don't always finish what they start. The garden fairies must have missed this one because it is pure white. Now where did I get this one? I have no idea! I don't recall planting daffodils recently in the place where this one is, so I must have planted it several years ago. 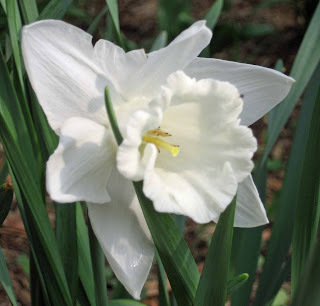 And I don't remember seeing a white daffodil in the garden before so I'll call this one "The Ghost". Another name might be "Icing" because I think it looks like it is made out of white icing. I really like it. It is a good thing I noticed the daffodils when I did because they are fading just as fast as these tulips shown below are starting to bloom and steal the show away from them. 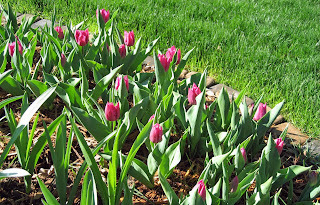 These are the tulips I planted last fall in my new flower bed. I planted these on November 4th, but I didn't keep track of the varieties (see above). I just wrote in my blog post that I hoped to have 4 - 6 weeks of bloom because I purchased early, mid and late varieties in various pastel shades. So far, I have these hot pink tulips blooming. I agree, not exactly pastel, are they? I'll have to keep an eye on this bed to see how much bloom I really get. These are ... I'll tell you tomorrow because I know some of you are good guessers and you'll guess right and that will leave you with a good feeling about how smart you are about flowers. 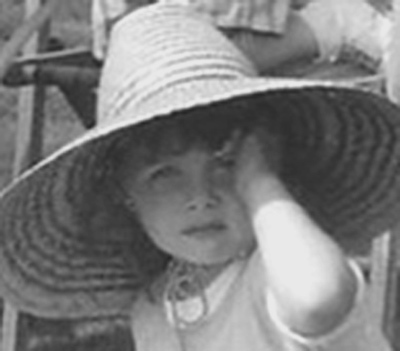 If you guess it wrong, I'll kindly reject your comment and secretly let you know (if I know your email address), so you won't be "outed" for not knowing. So, you have nothing to lose by guessing, and a good feeling about yourself to gain! Sooo, is that a thumbs down on the Pink Lips? Well, I like it. In fact, I was thinking last month it would be nice to have some pink flowering Narcissus next year to brighten up some of my shadier areas. Carol, I love your method of "naming." I never even try to remember daffodil or tulip names and I like your method better. 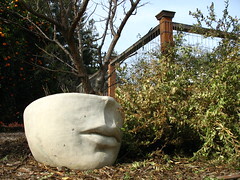 Perhaps I could use it as I peruse the perennials that are emerging now. I find myself walking around saying, oh there's that fluffy thing, or the lettuce-looking one is coming up. Pathetic! As for your mystery plant, it certainly must be a peony. Nothing else in my yard comes up with new red growth, but more than that I recognize the old brown hollow stems (must get to mine). If I'm wrong you can go ahead and publish as I have no shame anyway! Gorgeous flowers! And thank goodness for your posting. Now I can rest easy knowing those daffodils in the neighbors yard are "Fried Eggs". No peonies will come up in my Texas garden, but when the tips of Texas Star Hibiscus first break through the ground there's enough of a resemblance to make me feel nostalgic. Carol, you have quite a daffodil collection, and the names make as much sense as the ones in catalogs. I think your mystery growth is peonies as well. I haven't actually been out in my garden for a few days. I wonder if mine are coming up yet? 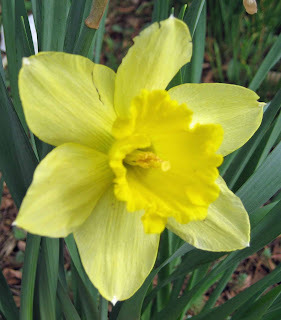 Your daffodil nicknames are as fun as those on paint chips. I love it! Oh, I'm glad Alyssa could identify the first narcissus. I noticed it in one of your earlier posts. I wonder if your pink daffodil might be the same as some I have? I don't know their names either, but I'm guessing 'Pink Charm'. Fried eggs a great description. Sunny side up. Well Happy Daffodil Day, then, Carol! Carol, I had to laugh when I read about buying 'pastel shades' of tulips and having them come up quite different from what was expected. Last year, my tulips came up bright red and yellow ... they were supposed to be deep purples and cream colours. The names you have given your daffodils are all so appropriate and much easier to remember! Lovely daffodils - thank you for sharing. I am having similar tulip issues this year....I also thing those shoots are peonies - I am very excited for those this year, as I planted a few new varieties. Love that "harried" - got to pick up some for myself! Perhaps the others will be pastel? Can't wait to find out! Carol the Daffodil look great; I wish I could grow Daffodils in Miami. A gardener in Central Florida told me that it is possible but that I would need to pull out the bulbs in the summer and put it in my refrigerator too much trouble. The first image, of a tousled little double yellow daffodil is Narcissus pumilus var. plenus, also known as 'Rip van Winkle'. 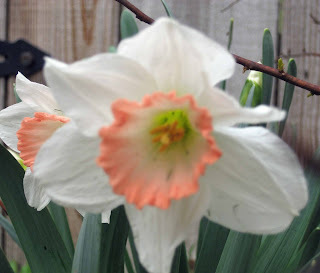 There are so many cultivars of trumpet daffodils that I'm hard put to attach a name for sure. However, 'Mt. Hood' is a lovely white that starts off with white petals and a pale yellow trumpet that matures to white. As good a guess as any. 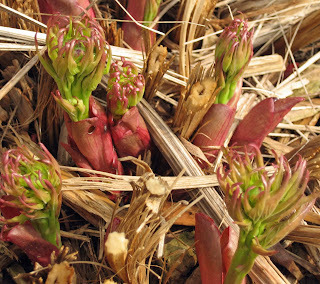 And the last image is peonies, hurry-scurrying into growth. Isn't it wonderful how just a couple of warm days brings the plants along. I see differences in my New Jersey garden between morning and dinner time. Everyone! Thank you for all the comments. Indeeed, yes, the last picture was of Peonies sprouting. Everyone got that right! 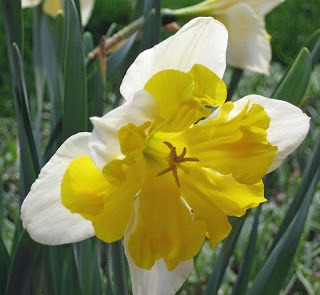 And, Allysa and Judy provided a "real" name for the daffodil that I called "Harried". It is actually "Rip Van Winkle". Just a few more days to enjoy the daffodils and then they'll go the way of the crocuses and I'll be enamored with a whole new set of flowers! Love the daffodils. They really tell us that Spring is here. I know in my head that zones have nothing to do with bloom time but it still seems wrong somehow that we are in the same zone and I don't have crocus blooms yet. I love the color of the tulips, bright colors after months of brown and white.